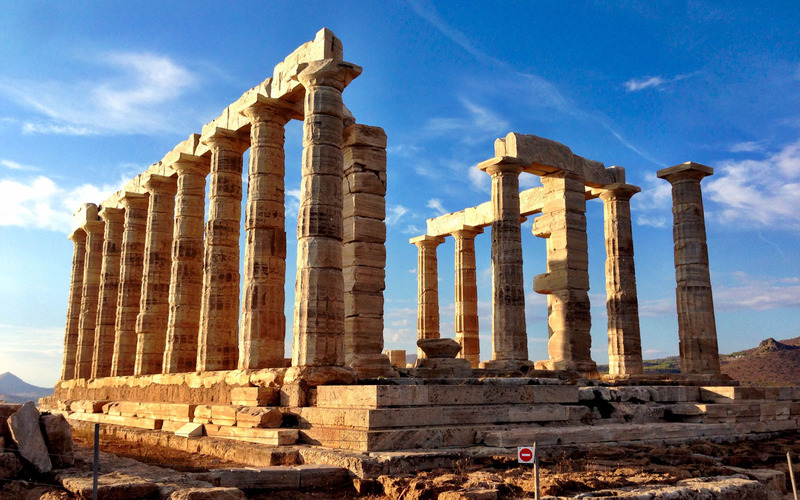 Whilst staying in Athens I took part in an excursion organised by Key Tours, where we visited the ruins of the ancient marble temple of Poseidon, God of the Sea. In hindsight, the excursion by bus was perfect, even with the hour and a half bus journey. The small luxury bus had plenty of leg room, which is always the main issue for me when travelling by bus because of my height. 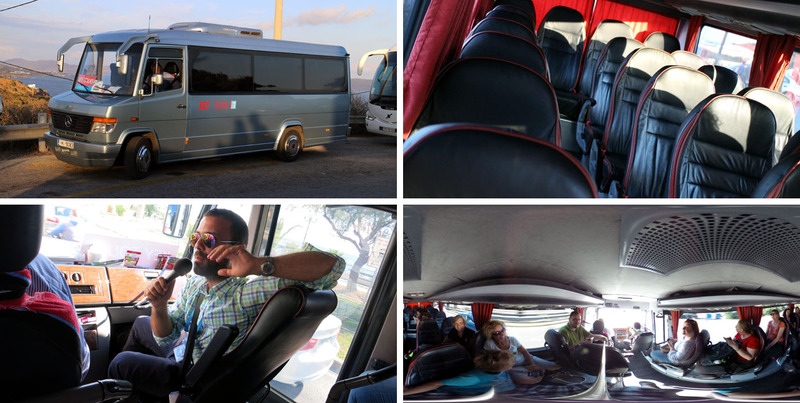 The bus was very comfortable and, on route, the guide told us (in English) a little about the suburbs of Athens and the coast. He had plenty to tell us and had answers for every question. I of course remembered to take a 360° panorama using my Ricoh Theta (image below left), which you can see here. 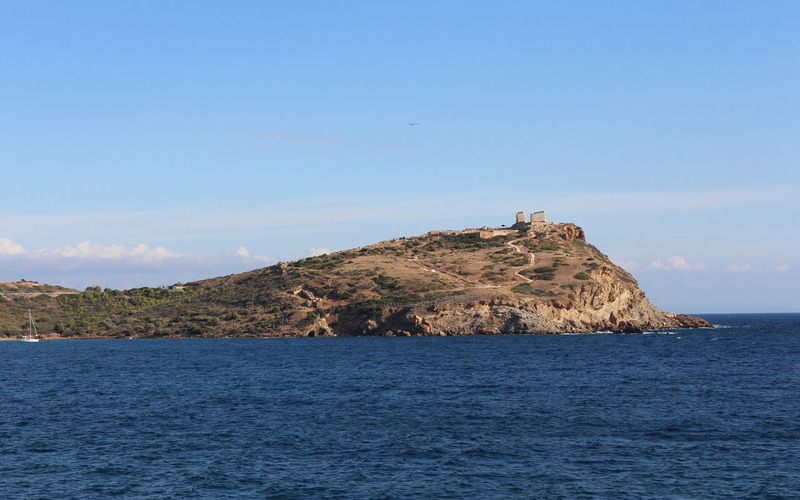 Shortly before our destination we made a stop at a regularly frequented car park, which was the perfect spot for getting a photograph of the Cape Sounion with the temple. At the foot of the temple there is a sort of café with a large terrace, which is perfect for grabbing a bite to eat or using the free toilet facilities. Be aware that this is a food establishment catering for tourists and so the prices here are higher than in other places. On a guided tour that lasted around 40 minutes, our guide showed us the ruins of the Temple of Poseidon, and he gave us plenty of information. I spared myself the historical details as I couldn’t take in everything, but the tour was designed to be very interesting and he was able to answer every question. Anyone wanting to learn more about the Cape and the temple can read the Wikipedia article as a starting point. Subsequently, the visitors were able to explore the ruins on their own but were not allowed to enter the temple. The lovely weather was somewhat marred by the strong winds, but this was only a factor because we had to make sure that the images weren’t blurred when taking photos. It was funny for everyone, though, but people should only undertake this tour if wearing suitable clothing. Shoes with a good grip are particularly important as the stoney floor can be quite slippery, even in dry conditions. In front of the temple I took another 360 degree panorama, which took a few attempts due to the strong winds. The journey back to our starting point was also very pleasant, whereby the conversation with the guide generally turned to Greek food. The tour was very nice and I enjoyed it very much. Anyone wanting to escape Athens for an afternoon should definitely consider the Cape Sounion excursion, on the southernmost tip of Attica. You can see more photos from my Athens trip in my photo album on Flickr. I was invited by Key Tours to go on this excursion as part of TBEX Europe 2014 in Athens, and would like to extend my sincere thanks to them for this.